Some Fantastic results for "The Quad Squad" at Newport last weekend. 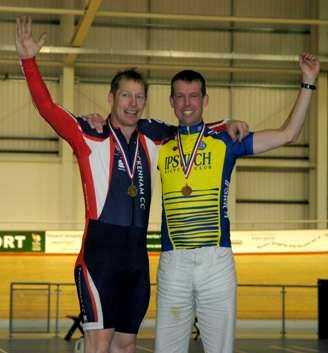 Rob Drinkwater took top spot in the mens 40-45 750m TT, plus was 4th in the Sprint competition. 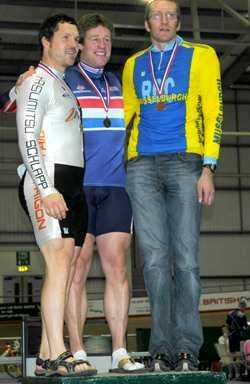 David Jack took Silver in the Points race and Bronze in the Sprint, plus was 5th in the scratch. 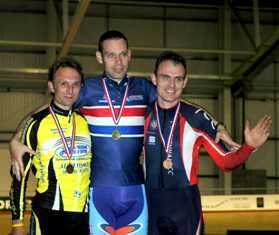 John Warnock took Bronze in the Points race, 4th in the Pursuit and 6th in the Scratch race & 7th in the Kilo. 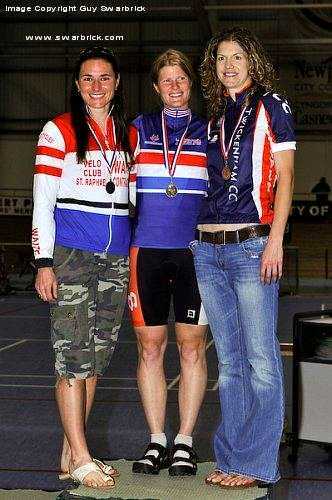 Nicki Drinkwater took Bronze in the 500 m TT and 5th in the Sprint competition. Next year we expect to see our exacting chairman show his stuff ! Read a Blow-by-Blow account of all 3 day's racing in the reports section. 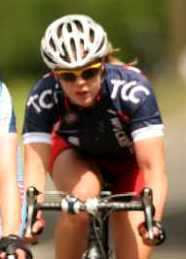 Congratulations to Jo Foster for completing this year's Etape du Tour from Pau to Hautacam in 9h20m. This year's beast of a ride was 165 km and took in the legendary Col du Tourmalet, an ascent of 23,4 km at a 7,5% gradient, before rounding off with the Hautacam for good measure (15,2 km at a 7,2% gradient). "I was wearing my jersey with pride however unfortunately I had to wear my rain jacket all day so didn't get to show off! I found it really really hard, pushed some physcological barriers that's for sure! It was the weather that pushed it too the edge for me, it was sooo cold and wet and visibility was really bad. The first 100km were quite boring and by the end of that i was soaking (1 puncture down) and then the climbs started. I was pretty nervous about the decent of the Tourmalet however it was ok (took it v slowly though) and once had hit the Hautacam it was ok (overtook a lot of people :-). One of my friends had a blow out on the decent of the Tourmalet and Hautacam - managed to control his bike both times but was very very lucky."